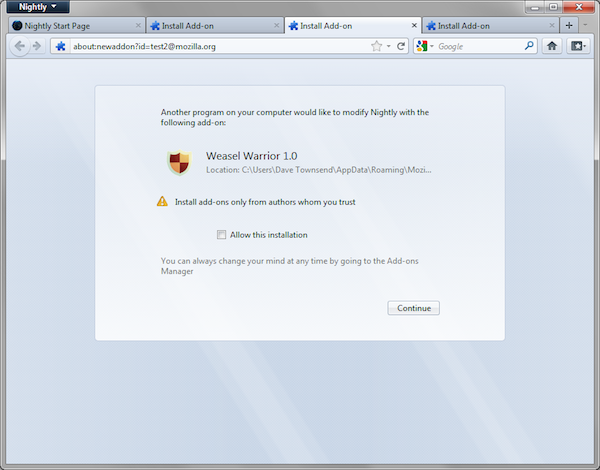 It is common for software installers to include add-ons that are installed into Firefox and other browsers. Since software installers can often be confusing and most users click through them without reading, we introduced the opt-in install screen to make it clearer that an add-on was being installed into Firefox as part of the application install process. This gives users another opportunity to understand what is going on and make an informed choice. Web install. Users are presented with a page that has an install button or link that they need to click on their own in order to initiate the add-on installation. External install. The add-on is installed through the Windows Registry or a global install location, triggering the opt-in install screen. It is forbidden to tamper with this install screen, including overlaying images or text on top of it or anywhere near it. There are two differences between this and previous policy. First, we used to allow a hybrid install method where an external installer opened Firefox and opened a new tab pointing directly to the XPI installer. After discussion with the SUMO team, we now realize that this isn’t clear enough for our users. Secondly, we’re making it clear that we’re not okay with installers placing information on top of the opt-in screen. This was becoming a trend in application installers and we hadn’t taken a clear position as to whether this was allowed or not. However, we’re not ignoring the reasons for which many add-on developers do this. We understand that the opt-in screen needs improvement, and we’re committed to making it better. Feel free to comment below or get in touch with us through our other contact channels. Let us know your concerns and how you think we can improve the install flow. I updated the Add-on Guidelines draft page to reflect this policy update. > It is forbidden to tamper with this install screen, including overlaying images or text on top of it or anywhere near it. How are you going to address this given that you can’t control when Windows apps choose to do this. Will you blocklist those add-ons? If the developers don’t fix them, yes. Has dragging local .xpi files or webpage links onto about:addons become unacceptable? I do that a fair amount for testing while developing an addon. That will still be possible to do, sure. How would an external application force trigger this screen on install, regardless of whether Firefox is open? As a user, I’d very much appreciate being able to associate the opt-in screen with whatever install action I just did; that means it should be possible to ping Firefox and ask it to prompt the user. If that’s in place, I’d feel more comfortable dismissing the dialog in cases I wasn’t expecting it. A not-so-friendly way to do this is to force restart Firefox during installation. Unfortunately, I don’t know any better way to do this, other than opening a tab that has a web install page. This is a huge step forward and will make a very real difference to our users who often don’t even know they’re running add-ons that slow down or make Firefox unstable. Great job guys!! Great stuff Jorge! This is going to be a big help to our users! Thank you for this. I appreciate it, and I hope it works out well. I’m an experienced computer user/programmer for over 20 years, yet I recently got an addon toolbar (Babylon) installed by software that I tried briefly. Uninstalling the software didn’t get rid of it, and amazingly, neither did uninstalling the toolbar. I wasted lots of time before finally purging this stupid thing.